Aren’t those beetles pretty? ;) And I’m not sure what kind of birds these are supposed to be but I love the design. I love them! One of my favourites here is black & white, on the outside reading around the mug it has directions for making the coffee, on the inside it says wake up. 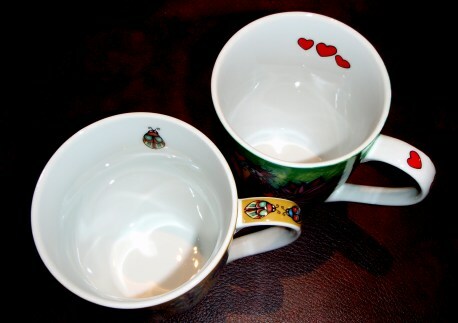 I love mugs and those are lovely ones. I have too many and never break any (touch wood!) So I can’t get more. I love IKEA but never walk out without buying at least twice as much as I planned too. 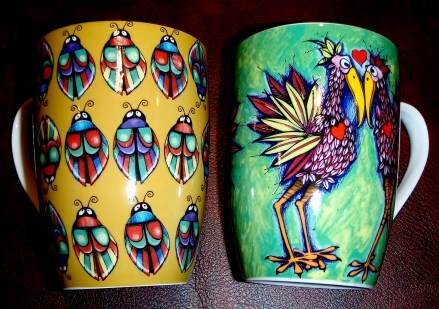 Luv the cups!!! Remind me of colorful ones my grandma used to use in the 70s:) Thank goodness IKEA is six hours away from me otherwise I’d be there a LOT. Due to the economic downturn I’ve cut back on my Etsy addiction but it’s so much fun over there!! !